Perched on the edge of a fjord, Norway's charming capital city has no shortage of natural wonders at its doorstep. But with a booming design scene, innovative Scandinavian restaurants and a chic take on fashion, Oslo has plenty of man-made marvels for those with a creative streak. Artistic expression has long been part of what makes Oslo a fantastic city to explore, and the ever-growing art scene offers everything from urban murals to expressionists masterpieces. No creative pilgrimage to Oslo is complete without a trip to Norway's National Gallery. The museum houses the largest public collection of art in the country, spanning the spectrum from drawings to paintings to sculptures. The most famous piece in the gallery is Edvard Munch's iconic "The Scream." The gallery, which was established in 1837, also has works by French Impressionists including paintings by Cézanne and Manet. Stop by Thursday for free entrance to this classic collection. Why stop at a single Scream? Norwegian painter Edvard Munch created at least four copies of his famous shrieking figure standing against a colorful Oslo background. The museum named in his honour has two more versions of the painting, as well as more than 1,200 other paintings, and nearly 20,000 prints created by the artist. The Munch Museum was also the location of one of the most notorious art heists in recent memory, adding to the artistic allure of the already noteworthy gallery. Oslo has a long history of supporting artists. One of the most interesting partnerships began in 1921 when the city agreed to build a studio and museum for sculptor Gustav Vigeland. In return, the artist donated almost all of his work back to the city of Oslo. The resulting museum that opened in 1947 represents Vigeland's life work - an array of sculptures in plaster, granite, bronze, marble and wrought iron. Outside, the Vigeland Sculpture Park is the world's largest outdoor sculpture collection by a single artist. Pristine cobblestoned streets and sweet storefronts are just one side of Oslo's metropolitan architecture. An emerging street art scene has sprung up in one of the capital's more bohemian corners. Ingens Gate, which translates to "Nobody's street," has become the epicentre of Oslo's colourful urban art scene. Brick walls are covered with murals and installation art (including outdoor chandeliers) regularly appear. On Sundays, a flea market selling wares from local artists adds to the area's creative flair. The dynamic neighbourhood of Tjuvholmen began as a dockyard but has been transformed by urban renewal into one of Oslo's best creative neighbourhoods. The modern day artist's retreat is best known for the Astrup Fearnley Museum of Modern Art - a private collection that is housed in a striking modernist building on the water. In addition to revolving shows by contemporary artists, the museum's permanent collection includes works by Francis Bacon, Jeff Koons and Cindy Sherman. While the Astrup Fearnley Museum is best known stop on the block, Tjuvholmen is also home to numerous galleries and outdoor installations that will keep any art lover busy between snack breaks for knekkebrød (Norwegian flatbread sandwiches). 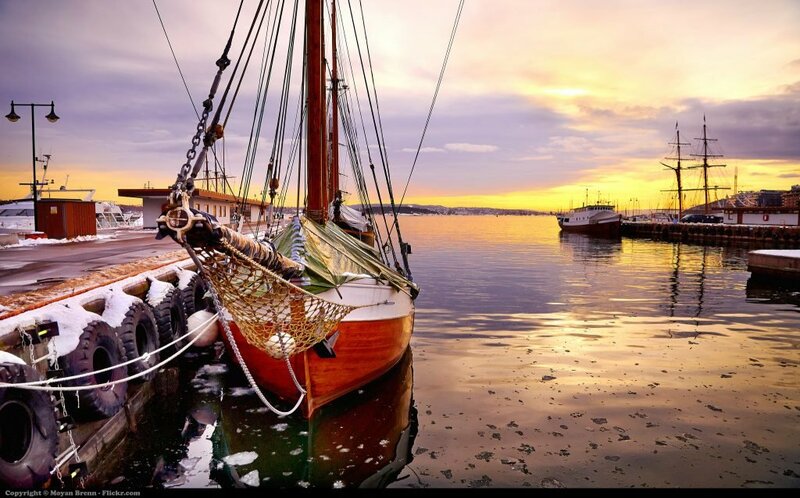 Oslo makes a perfect city break for any art lover! Modern high-rise hotel with imposing glass façade, situated just 50 metres from the Royal Palace in Oslo's city centre. Best Western Hotell Bondeheimen is located in downtown Oslo, 100 meters from the main street, Karl Johans gate, and a short walk from the Parliament and National Gallery. The airport bus and train both stop minutes away. It's a 3-minute walk to Stortinget Metro Station, and 10 to the main station. With a fantastic location in the heart of the city, this new hotel is just steps away from OsloZs main pedestrian area and some of the best shopping in Norway. 118 bright modern guest rooms - 6 flexible, high-tech meeting rooms. RBG Bar & Grill offers gourmet burgers, snacks, a choice of soups, local dishes, salads and signature dishes from the grill. Free Wireless Internet. Located in Gardermoen, this hotel is 0.3 mi (0.5 km) from Ullensaker Museum and 1.8 mi (2.9 km) from SAS Museum. Munch Museum and Oslo Opera House are also within 32 mi (52 km). Located in Gardermoen, this eco-friendly hotel is 1.1 mi (1.8 km) from SAS Museum and 3.3 mi (5.4 km) from Ullensaker Museum. Munch Museum and Oslo Opera House are also within 32 mi (52 km). Set in the heart of Oslo the cosy Doubletree by Hilton Oslo City Center hotel occupies an historic 1918 building that once housed Scandinavian businesses and playhouses. Today we share our lobby with Oslo*s famed Christiania Theater. This Oslo hotel is a 5 minute walk from the National Theatre train station where guests can catch the express train to the airport. Local buses tram and subway stations are all nearby for access to all parts of the city.All of the elegant accommodations at this contemporary Oslo city center hotel feature modern bathrooms luxurious bedding LCD TVs and complimentary internet access.Dine in our welcoming Tre Galli Ristorante which overlooks Oslo*s tree-lined promenade Spikersuppa. Begin the day with our Doubletree Breakfast buffet or enjoy weekday lunch in our inviting Lobby Bar area or relax in the evening with a glass of wine or a classic cocktail.The Royal Palace the Noble Peace Center and Akershus Castle are all within walking distance of this Oslo hotel. Stroll along the waterfront and catch a ferry to charming Bygdoy Peninsula with its Viking museums. Or explore the exclusive shopping precincts Paleet Eger and Aker Brygge. Whether you come to Norway for business or pleasure our caring hotel staff looks forward to welcoming you to Oslo with our signature warm Doubletree chocolate chip cookie at check-in. This modern three-floor hotel is situated only three kilometres from Oslo Airport and 10 kilometres from the Jessheim Storsenter shopping area. Bordering the River Akers, this modern hotel is under a kilometer from the train station and the main street of Karl Johan. Decorated in earthy tones and simply furnished, the 264 guestrooms all come with satellite television and Internet access. Guests can start the morning with a buffet breakfast, and later relax in the hotel's bar after busy days sightseeing. Located in Gamle Oslo, this hostel is within 1 mi (2 km) of Botanical Museum and Munch Museum. Oslo Opera House and Karl Johan Street are also within 2 mi (3 km). Located in Gamle Oslo, this hotel is within 1 mi (2 km) of Botanical Museum and Munch Museum. Oslo Opera House and Karl Johan Street are also within 2 mi (3 km). Modern mid-scale and full service hotel centrally located at Oslo International Airport at Gardermoen, only 100 meters from the terminal & railway station -The hotel boasts 300 rooms as well as 46 meetingrooms. Guests must be over 18, ID required at check in. Children under 18 stay free withparents in existing bedding. Free broadband. Centrally located five-story hotel set in a late 18th-century building on Oslo's main parade street, Karl Johan. Saga Hotel Oslo is located in leafy Uranienborg, just 10 minutes on foot from Oslo's Royal Palace. The cafés and boutiques of Bogstadveien are just 5 minutes away, while the Oslo City Museum, Vigeland Sculpture Park, and the open-air swimming pools of Frognerparken are a 10-minute walk. This simple, modern hostel is located in Oslo city centre, just 700 metres from the main thoroughfare of Karl Johan Street, and the Cathedral and Botanical Gardens.